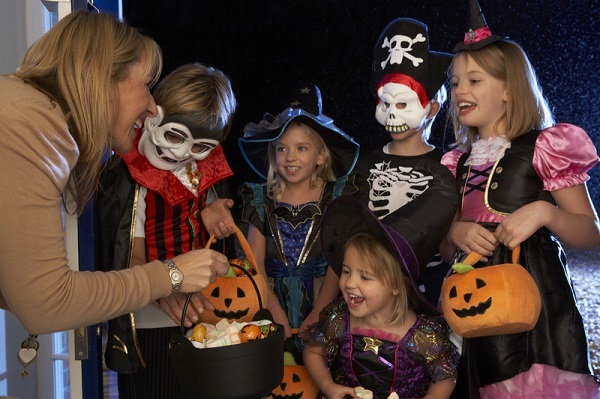 When most Americans think of Halloween, we think of candy corn, costumed kids, Trick or Treating and haunted houses. But according to History.com there is a much more macabre, true story of Halloween. So on this festive Halloween week, I thought I’d share some of the history and some of the more interesting Halloween traditions from around the world and of course. And…of course a nod to Halloween Westlake Village residents and surrounding communities! We do Halloween in our own inimitable style! People would light bonfires and wear costumes to ward off roaming ghosts. In the eighth century, Pope Gregory III designated November 1 as a time to honor all saints and martyrs; the holiday, All Saints’ Day, incorporated some of the traditions of Samhain. The evening before was known as All Hallows’ Eve and later Halloween. Over time, Halloween has obviously evolved—at least in America— into a candy and fun holiday rather than a sacred religious ritual. But did you know in some parts of the world it is just as popular. Traditions connected with the holiday include building private altars called ofrendas , honoring the deceased using sugar skulls , marigolds , and the favorite foods and beverages of the departed, and visiting graves with these as gifts. They also leave possessions of the deceased. The Halloween-equivalent holiday in China is known as Teng Chieh. The Chinese tradition is to place food and water at the foot of photographs of deceased family members and light bonfires and lanterns in order to forge a lit path for the spirits to travel on Earth on Halloween night. An article on Inspirationline, describes one tradition of Buddhist followers in China. They make “boats of the law” from paper and light them on fire. Some of the “boats” are quite elaborate and burn for hours. This particular ritual is a memorial of course to honor the dead, but more importantly is meant to free spirits of the “pretas” in order that they might ascend to heaven. According to The New World Encyclopedia, “Pretas” are “hungry ghosts” but not evil. They are simply the spirits of those who have died tragically and without a proper burial ceremony. Ceremonies for the “pretas,” include lighting fires and lantern rituals and often monks are invited to recite sacred verses and leave fruit offerings. Westlake Village – A Rockin’ Halloween! Bogie’s Nightclub at The Westlake Village Inn is sponsoring, its 4 th Annual Halloween Bash FREAKSHOW WEDDING, on Saturday November 1st. Call to reserve your tickets for party complete with music and a DJ! Reserve now – it sells out! The Haunted House at the Janss Marketplace promises an unparalleled Reign of Terror with over 65 bone chilling rooms and 12,000 sq. ft. of mayhem! This is one of the country’s top-ranked scare zones and it’s right here! Reign of Terror attracts thousands of thrill seekers each Halloween season to raise much-needed money for the Thousand Oaks Teen Center and Young Artists Ensemble programs. Read more here. Want to experience all the greatness that is Westlake Village? Thinking of investing or buying a home in the area, choose the top ranked Westlake Village Realtor. Live in luxury, inspired by the beauty of nature and a 365 day temperate climate. Live like you are on vacation every day! Choose Lydia Gable as your real estate agent on your next dream home purchase. For more on homes in Lake Sherwood, Hidden Hills or anywhere in the Conejo Valley, contact Lydia Gable today.